Only 20 Spot Available. Make Your Reservation today! 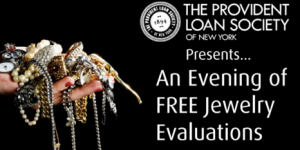 If you have a jewelry box full of old jewelry but can’t tell rhinestones from diamonds; make a FREE reservation to meet one of our expert appraisers for a free verbal jewelry evaluation. We can speak about what kind of valuables you have and their approximate value. Our expert Jewelry Appraiser Anthony LoRe has 42 years of experience in the jewelry industry. Anthony is Director of the Appraisal Department of The Provident Loan Society and is a Graduate Gemologist from The Gemological Institute of America. *Limited seating by reservation only. Each reservation is limited to 5 pieces of jewelry that they would like evaluated.